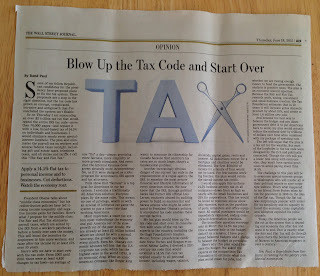 Occasionally there is such a powerful economic article that is needs to be read verbatim; Rand Paul's "Blow Up the Tax Code and Start Over" is one of these. As a free-market champion and supporter of meritocracy, this blog wholly supports the idea of a flat tax and the diminished power of a revenue "service" run amok. Some of my fellow Republican candidates for the presidency have proposed plans to fix the tax system. These proposals are a step in the right direction, but the tax code has grown so corrupt, complicated, intrusive and antigrowth that I’ve concluded the system isn’t fixable. Another increasingly obvious danger of our current tax code is the empowerment of a rogue agency, the IRS, to examine the most private financial and lifestyle information of every American citizen. We now know that the IRS, through political hacks like former IRS official Lois Lerner, routinely abused its auditing power to build an enemies list and harass anyone who might be adversarial to President Obama’s policies. 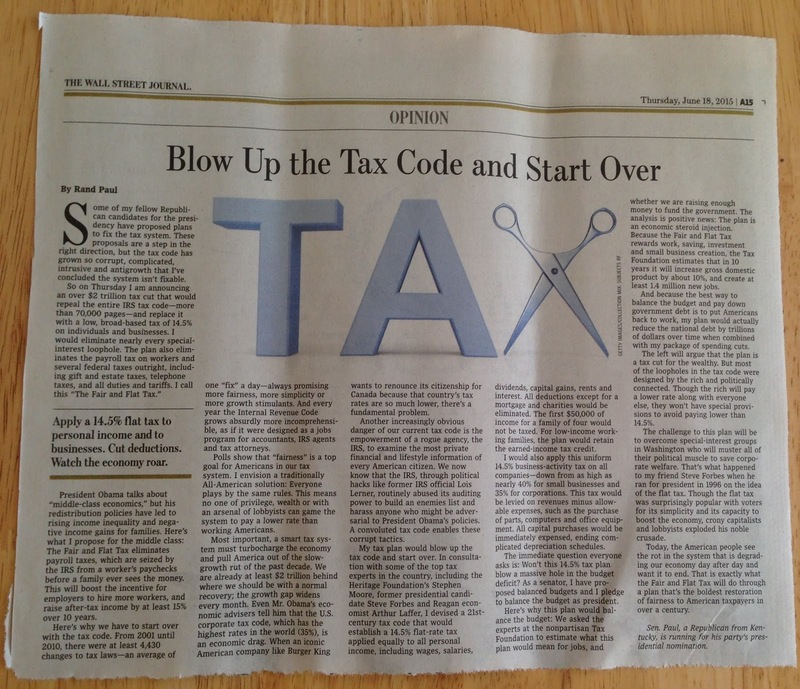 A convoluted tax code enables these corrupt tactics. My tax plan would blow up the tax code and start over. In consultation with some of the top tax experts in the country, including the Heritage Foundation’s Stephen Moore,former presidential candidate Steve Forbes and Reagan economist Arthur Laffer, I devised a 21st-century tax code that would establish a 14.5% flat-rate tax applied equally to all personal income, including wages, salaries, dividends, capital gains, rents and interest. All deductions except for a mortgage and charities would be eliminated. The first $50,000 of income for a family of four would not be taxed. For low-income working families, the plan would retain the earned-income tax credit. The challenge to this plan will be to overcome special-interest groups in Washington who will muster all of their political muscle to save corporate welfare. That’s what happened to my friend Steve Forbes when he ran for president in 1996 on the idea of the flat tax. Though the flat tax was surprisingly popular with voters for its simplicity and its capacity to boost the economy, crony capitalists and lobbyists exploded his noble crusade. Today, the American people see the rot in the system that is degrading our economy day after day and want it to end. That is exactly what the Fair and Flat Tax will do through a plan that’s the boldest restoration of fairness to American taxpayers in over a century.